Suburban shopping arrived in Tenleytown when Sears, Roebuck & Co. erected a Moderne style store here in 1941. The sleek façade demonstrated the latest in department store design. 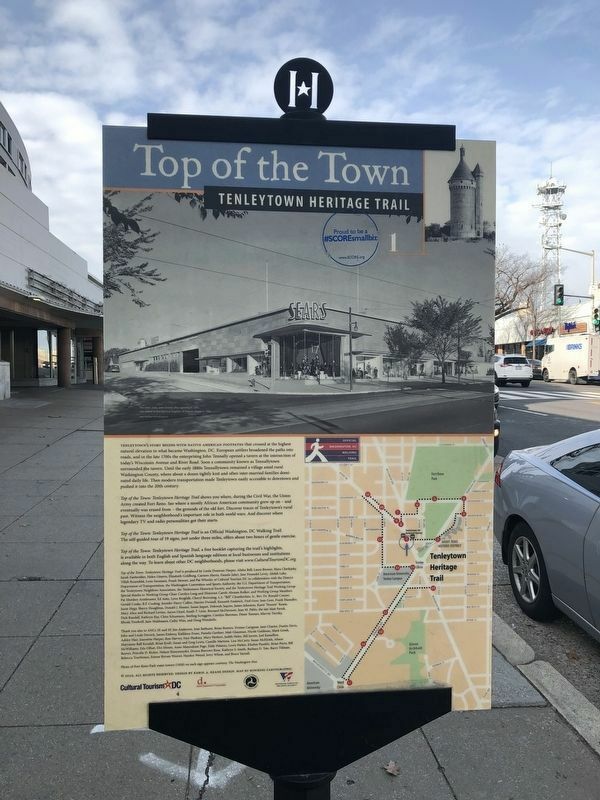 Sears was the second Tenleytown business — after Giant Food — to offer rooftop parking. The aromas of popcorn, half smokes, and doughnuts led customers to Sears' entrance/penthouse snack bar. Attracting shoppers from the city and nearby Maryland, Sears ushered in Tenleytown's modern commercial era. Sears replaced the three-story former Tenleytown Inn, the neighborhood's oldest commercial landmark. Beginning in the mid-1800s, the inn was a stopping point for farmers and merchants traveling on the Georgetown-Frederick (Maryland) Pike. 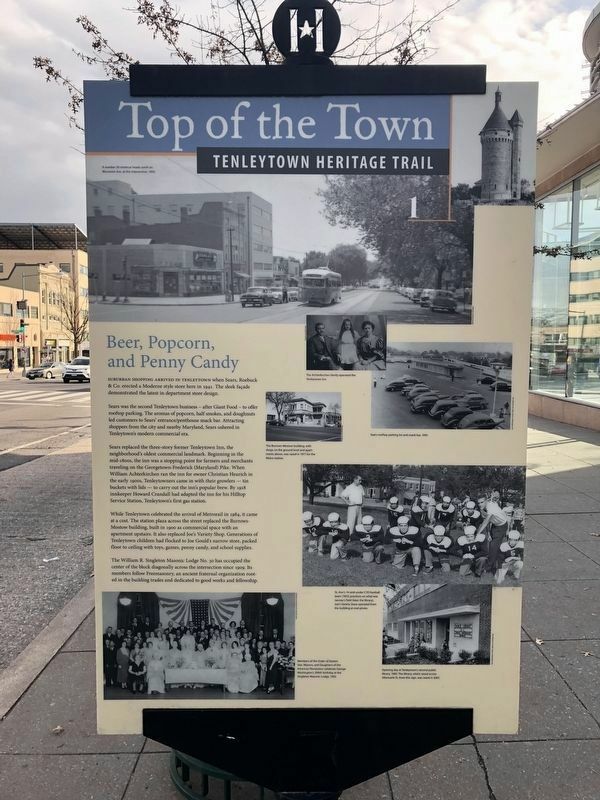 When William Achterkirchen ran the inn for owner Christian Heurich in the early 1900s, Tenleytowners came in with their growlers — tin buckets with lids — to carry out the inn's popular brew. By 1918 innkeeper Howard Crandall had adapted the inn for his Hilltop Service Station, Tenleytown's first gas station. a cost. The station plaza across the street replaced the Burrows-Mostow building, built in 1900 as a commercial space with an apartment upstairs. It also replaced Joe's Variety Shop. Generations of Tenleytown children had flocked to Joe Gould's narrow store, packed floor to ceiling with toys, games, penny candy, and school supplies. The William R. Singleton Masonic Lodge No. 30 has occupied the center of the block diagonally across the intersection since 1909. Its members follow Freemasonry, an ancient fraternal organization rooted in the building trades and dedicated to good works and fellowship. Location. 38° 56.889′ N, 77° 4.804′ W. Marker is in American University Park, District of Columbia, in Washington. Marker is on Wisconsin Avenue Northwest north of Albemarle Street Northwest, on the right when traveling north. Touch for map. 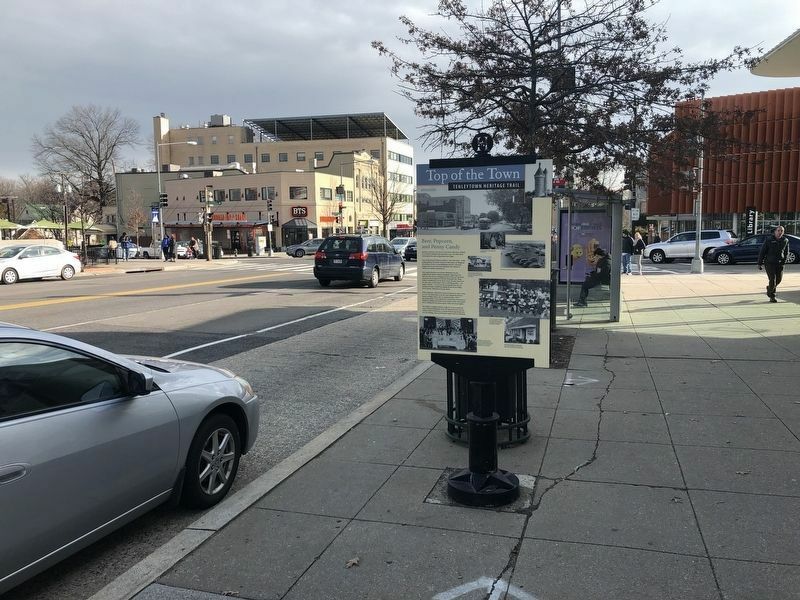 Marker is at or near this postal address: 4500 Wisconsin Avenue Northwest, Washington DC 20016, United States of America. Touch for directions. (about 700 feet away); On the Circle (about 700 feet away); A Country Road (approx. 0.2 miles away); Set in Stone (approx. 0.2 miles away); Reno City (approx. 0.2 miles away); Luis Alves De Lima E Silva (approx. 0.2 miles away). Touch for a list and map of all markers in American University Park. More. Search the internet for Beer, Popcorn, and Penny Candy. Credits. This page was last revised on March 17, 2019. This page originally submitted on January 27, 2019, by Devry Becker Jones of Washington, District of Columbia. This page has been viewed 56 times since then. Last updated on March 8, 2019, by Devry Becker Jones of Washington, District of Columbia. Photos: 1, 2, 3. submitted on January 27, 2019, by Devry Becker Jones of Washington, District of Columbia.